By the time Cheesetique's new location was open for business, the sign for Let's Meat on the Avenue was up outside the old location, tantalizing those of us who loved the idea of a new honest-to-goodness butcher shop on Mount Vernon Avenue. Stephen Gatward, the man behind the counter, may have kept foodies waiting for a month or so, but he opened Let's Meat on the Avenue to such a tremendous response that he actually sold out of everything he had to offer on his first day of business. 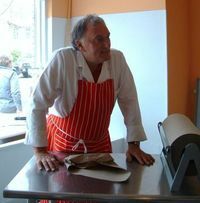 Though he previously worked in advertising in the area, Gatward has years of experience as a butcher in England and Australia, and his experience shows in the beautifully trimmed cuts of meat on display in the single refrigerated case that runs along the left side of the store. A word of warning - it's far too easy to be drawn in by the steaks, chops and sausages that fill the case (assuming you get there early enough in the day), and it's embarassing to leave smudgy noseprints on the glass. They really are that good-looking, with the steaks ranging from thin and bright red to thick, deeply marbled, and bordering on purple in color. Chops stand out more for their uniformity than any particularly unique appearance. And the sausages, including both those made on-site by hand and those brought in from Amish vendors in Pennsylvania, have a rich meatiness to them that you just don't find in commercial preparations. 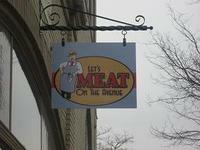 If you like your meat local and minimally processed, Let's Meat on the Avenue has your number. They bring in cuts of beef and lamb from Fauquier's Finest, a country butcher shop and meat processing facility in Bealston, Virginia, and Gatward is proud to sell Bell and Evans chickens (a brand noted for its commitment to raising their birds naturally). In addition to the meats on offer, Let's Meat on the Avenue sells a wide range of spices, rubs, marinades and other items that can enhance your carnivorous cuisine. They also sell t-shirts bearing the logo of the shop (banking on the friendly image and foodies' eager embrace) and a table full of smoked bones still rich with marrow that are guaranteed to earn you the undying loyalty of just about any dog. Gift certificates are also available (they charge tax on the purchase, ostensibly so that the recipient can spend it tax-free). Although the prices are nothing like what you'll find at Safeway (no $0.89/lb specials here), you can't help but feel like you're getting quality for the money. 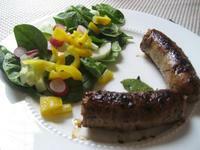 The meat is tender and tasty, with a flavor that is clear and strong. 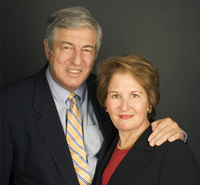 Whether or not you agree with food writers like Michael Pollan and Barbara Kingsolver who talk about the "true costs" of food in terms of economic, environmental, social and health impacts, it's not hard to justify the added expense for Let's Meat on the Avenue's products. If you find yourself in Del Ray (scratching an itch for frozen custard at the Dairy Godmother or hot chocolate at Artfully Chocolate Kingsbury Confections), do yourself a favor and stop in to see what Steve has available at Let's Meat on the Avenue. And if there's something specific you're looking for, do yourself a favor and ask. If they don't have it in stock, they can usually special-order. But be prepared to find slim pickings if you stop by too late on a Saturday - the Farmers' Market crowd tends to do their shopping early, and they have embraced Let's Meat on the Avenue in a big way. Heard around the DC Foodies blogosphere this last week...Iced coffee is cool again. It's ok, really, according to the Washington Post's article entitled "Roasting Raises the Coffee Bar" by Michaela Weissman. You can enjoy a "transcendent" cup of Kuta coffee over ice, served up by David Gwathmey at Grape + Bean in Alexandria's Old Town. This week, The Garden Apartment also reported on a visit to Grape + Bean, which highlights fair trade Counter Culture coffee. She tells of her husband's enlightenment when savoring a cup of la Golondrina and recommends that coffee enthusiasts check out a book called God in a Cup. If you find that wine tasting is your thing, you can look forward to continuing your tasting in Columbia Heights, where the 11th St. Deli is becoming a wine bar with indoor and outdoor seating, according to Prince of Petworth. Across the Potomac in Virginia, you can enjoy Old World labels with a concentration on France at Bar Baudelaire above La Gaulois on King Street in Old Town. Bar Baudelaire also offers terrines, French cheeses and charcuterie. Chef Andrew Markert will take over as Executive Chef at Tallulah, according to Apples and Bananas. Chef Markert, most recently the Chef de Cuisine at Vermillion, will continue to oversee menus at both Tallulah and Eat Bar, according to Michael Babin, President of the Neighborhood Restaurant Group. In a quandary over what restaurant to book for Restaurant Week? Capital Spice can help you narrow down your choice geographically with a helpful Google map that locates every restaurant participating in next month's DC Restaurant Week. For any DC Foodie in need of validation that we do indeed live in a gastronomic destination, Anthony Bourdain filmed an episode of No Reservations here last week. Spotted at Cafe Atlantico, the Penn Quarter farmers market, Eamonn's and the PX, Bourdain sightings brought no small amount of excitement to the blogs and boards. And, perhaps, new friendships. Jacques Pépin's "The Apprentice: My Life in the Kitchen"
Those old enough to remember 1970s television might recall the pre-cable, slot-filling cooking shows, where Julia Child and the Galloping Gourmet reigned among brick-walled kitchens and hanging copper pots. You might also remember a dashing Frenchman named Jacques Pépin, who entered the NY cooking scene in the early 1960s and quickly rose through the ranks via talent, connections, and joie de vivre. His memoir, The Apprentice: My Life in the Kitchen, reads as a response to all the people who must have told him over the years, "Jacques, you've had an incredible life. Why don't you write an autobiography?" And so he did, with equal parts humility and insouciance. Indeed, beginning with his childhood in small-town France, he suffuses The Apprentice with a modesty and gratitude that never descends into an "aw shucks, little ol' me?" corniness. It's as if the better parts of his French and American natures rose to the surface to produce a noble and modest reflection on a fascinating – indeed, charmed – life. His advancement in the culinary world was phenomenal yet uncalculated, his successes the result of 10% hard work and 90% simply being in the right place at the right time. The hard work began early and crafted an ethic that helped him rise through an increasingly prestigious succession of French restaurants. Packed off in 1949 to a three-year apprenticeship with Le Grand Hôtel de l'Europe in Bourg-en-Bresse, at the age of 14 yet still dressed in the short pants of a boy, he describes in engaging detail the system of brigade de cuisine, the traditional and intense training where aspiring chefs spend years cycling through every station in the kitchen. Progression is prohibited until mastery is achieved. His is an incredible insight into the overheated, frantic, steamy and mysterious world that sparks a voyeuristic response in any dedicated foodie. 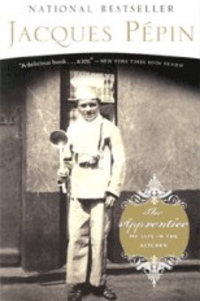 Pépin's explication of the traditional apprenticeship is worth the price of the book alone, not just for the nostalgic details of a sometimes esoteric field, but also because it is a startling contrast to today's specialized roles in U.S. kitchens, where a cook is hired and trained to do one thing and one thing only. In fact, it's hard to imagine someone today, in our celebritized culture of culinary rock stars, deigning to submit to the militaristic regime of Pépin's era, where there was room in the kitchen for only one ego. Indeed, Pépin, who started as a cleaner – of the kitchen, not food – was forbidden to even approach le piano, the immense oven at the heart of Le Grand Hôtel's kitchen. Finally, after a year of unpaid 15-hour days spent cleaning, prepping and observing, the "Chef suddenly materialized” beside him. It was the first time I'd heard him utter my proper name. ‘Tomorrow you start at the stove.'" Yet after a three-year tour of duty, he still had risen no higher than third commis, "a trainee, one tiny step above apprentice." The other value of Pépin's memoir is the insight he offers laypeople into simple French country cooking. The French's love of offal, if we have learned nothing else from Anthony Bourdain, exhibits a passion for frugality that extends to every ingredient available, sparing nothing and turning it all into a hearty meal. Following his move to America, Pepin could be seen tramping through the woods hunting for wild mushrooms or scouring the Mendocino coastline for escargots. Even Billy, a feral sheep terrorizing his Hunter, NY neighborhood, became sautéed kidneys and sweetbreads. As his many anecdotes show, you can take the boy out of the countryside, but you can't take the countryside out of the boy. 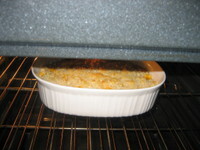 Despite his Parisian training and a diplomatic job cooking elaborate, no-budget meals for heads of state (following an unexpected turn of political events that landed him the title First Chef of France), many of the recipes with which Pépin ends each chapter are from his beloved Maman: cheese soufflé, apple tart, stuffed eggs. In fact, only four of the nineteen recipes come from his high-end chef days. The remainder are hearty soups, brasserie fare and favorites he adopted from his friends in the U.S.: pork ribs and red beans, scallop ceviche, pasta primavera. His simple recipe for Chicken Salad à la Danny Kaye, who was famous for comedy but largely unknown for his enviable talent as a chef, sets a new standard for a pretty basic dish – it's that good. In addition, Pépin's recipes are simple and use only common, unpretentious ingredients, yet they are elaborately explained, eliminating any of the familiar "Does this mean I'm supposed to…" doubts that recipes sometimes foster. His recipes and his instructional manner – actually, the man himself – are the perfect antidote for anyone intimidated by French cuisine, which perhaps explains his wide appeal to Americans. Pépin, in the 73rd year of a rather charmed life, is enjoying a full-on embrace of the multimedia world. He has too many book titles to list, but most notable are his seminal cooking guides, La Technique and La Methode. These manuals are, interestingly enough, the means by which Tom Colicchio taught himself how to cook, and are available combined under the title Complete Techniques. Pépin also has a website (www.jacquespepin.net) and a PBS series on DVD, Jacques Pépin: Fast Food My Way, with a follow-up, More Fast Food My Way, reportedly in the works. Here are the details about what the different restaurants are offering for Bethesda Restaurant Week for Summer 2008. We're still getting details in from the restaurants, so stay tuned if you don't see a restaurant you are interested in going to. Offering a special menu for lunch for Restaurant Week. Assaggi will also have their normal menu, but it will be normal price. Offering a subset of their normal menu. Their normal menu is normally 12 pages, the Restaurant Week menu is 4 pages. Lunch menu is here, Dinner menu is here. Famoso is offering a choice of four appetizers, three entrees and three desserts for Bethesda Restaurant Week patrons. Choose between a gratin of scallops, caesar salad, a mesclun mix and the soup of the day for your first course, a pair of pastas, tuna fillet with ratatouille and chicken paillard for your entree, and panna cotta, sorbet or ice cream with fruit and nuts for your dessert. Faryab is closed on Mondays, so you may want to plan accordingly. Gaffney's is participating at both lunch and dinner, but please note that their lunch menu is set at $15 instead of $12. Menus for both are available on their website. Menu for Bethesda Restaurant Week is posted on their web site now. Definitely review it before making your reservation because it's a little complicated. For Bethesda-Chevy Chase Restaurant Week, Jaleo Bethesda will be offering a choice of any two tapas for $12 at lunch and a dinner that is 3 tapas plus a dessert plus coffee or tea for $30. 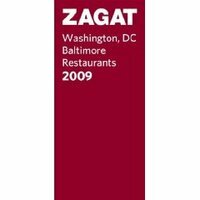 They will also be participating in DC Restaurant week, where they will offer a choice of any two tapas from modern classics, a soft drink and flan or sorbet for $20.08 at lunch and a soft drink, gazpacho or green salad, three tapas, flan, sorbet or chocolate hazelnut dessert for $35.08 at dinner. La Ferme is offering a 2 course lunch menu for $15 and which is available Monday-Friday from 11:30-2:30. Dinner is 3 course menu offered at $30 and is available Monday through Sunday from 5-9:30. Dinner is $30 for 3 courses from a "Summer Special Menu" which is a selection of 3 appetizers, 4 entrees and 3 desserts. Most of their normal menu will be available. Menu for Bethesda Restaurant Week is available here. Bethesda Restaurant Week menu is posted on their web site. Having just co-hosted a large rose event with TasteDC, I was recently fortunate enough to revisit a good number of this year's crop of pink wines. Here are some of the highlights (and lowlights). Though France is best known for its high-end wines, Vin de Pays (cheaper wines, literally "Country Wines") represent many of the best values in the world. This 100% Syrah from the Languedoc region in southern France shows a light pink, slightly orange color in the glass. On the nose, it has a nice blend of red fruit and spice. On the palate is where this wine differs from most, being relatively low in acid — this makes the finish rather short, but leaves the texture rather round and mellow (like Chardonnay). A great ice-cold quaffer, and at such a modest price, you can enjoy it all summer. A perennial favorite from local importer Robert Kacher, this particular incarnation is not very good, even for $10. The nose is redolent of fresh rubber and alcohol, and on the palate the wine is washed out, chemically accented, and lame. Usually I am not one to say this, but the Grande Cassagne '07 is an objectively bad wine. Stick with Bobby's Petite Cassagne, which I reviewed in my first rose post. This rich Malbec rose from Argentina shows a rich, dark burgundy-pink in the glass, and gives off scents of cinnamon, savory herbs and red raspberries. More raspberries on the palate, along with a slightly bitter quality, give way to a surprisingly dry, full, almost tannic finish. 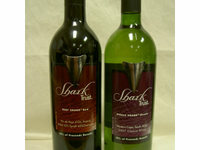 This wine's weight, fruit, and dry finish make is a wonderful pair with your spicier Indian food, such as Tandoori Lamb. This Cabernet/Merlot blend from northeast Spain is unusual, in that about 10% of the wine is fermented in American oak. Though the nose shows a typical amalgam of strawberries and flowers, even that small bit of oak gives this wine a buttery quality on the palate, an unusual trait for a rose. 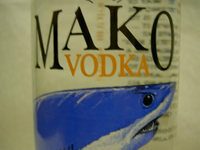 Despite the atypical texture, the finish is clean and sharp due to the wine's poignant acidity. Given its unique profile, this wine would make a great pair with foods most often served with Chardonnay, including scallops, pork, heavier fish, and even cream sauce. Incidentally, to reiterate a point I made in my last rose diatribe, keep an eye out for the bad stuff — lots of restaurants around town are still trying to hawk turned wine to turn a profit. Just recently, I noticed that two restaurants I really enjoy have been selling such dead juice. Vapiano in Arlington is selling a pretty bad 2005 Cusumano Rose for some $7 per glass, and Kaz Sushi Bistro has the gall to offer a $28 rose from 2002 on its wine list (I did not order this, but asked the waitress, and was assured that the vintage was correct)! Now, these are two of my favorite eateries (for very, very different reasons), which goes to show that even respectable establishments may take the low road as regards the pink stuff. Buyer beware! There are a million childhood memories, songs and lunchtime favorites I could site in my introduction to making peanut butter, but I'll skip the trip down memory lane and just say this – you should be making your own peanut butter. For those of you who enjoy natural peanut butter, skip the jar and recreate your favorite brand at home; it's not that difficult. Armed with a food processor, you can add just about anything that gives your favorite natural brand its signature taste and texture. For those of you who relish that classic jar of Jiff, Skippy or Peter Pan, I say take a walk on the health nut side and do something good for yourself. Some say natural/home made peanut butter is an acquired taste…I suggest you acquire it. If not for taste's sake, then for health's sake. What better way to regulate the amount of hydrogenated oils, salt and sugar you put in your body? The basic recipe is simple. Start with two cups of shelled, roasted peanuts (salted or unsalted will work, or you may want to start with unsalted, so you can add a small amount of salt later to taste). Add the peanuts to your food processor and begin blending. The process will take a few minutes, as the peanuts go from grainy to a smoother consistency. Stop your blender every minute and scrape the sides, making sure all the peanuts are well chopped; this takes about 3 minutes. After 3 minutes, add a tablespoon of oil (I recommend peanut or vegetable oil) and/or a tablespoon of honey through the top of the processor, while it's blending. These will help bind the nuts together and give the peanut butter a smoother consistency. You can add more oil or honey as you check the consistency of the peanut butter every minute. When you're happy with the consistency, taste the peanut butter and decide what other ingredients you may want to add. For chunky peanut butter, hand chop some peanuts and add them to the mixture. 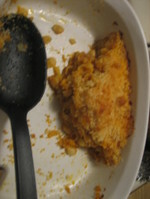 You can also stir in salt, or add more honey or agave nectar and give it another 30 seconds or so in the food processor. The final product will be just over a cup of smooth, creamy peanut butter. 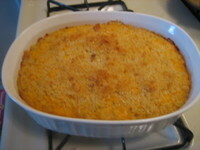 -This recipe has the perfect texture for a peanut butter cup recipe. I tried Chowhound's Peanut Butta Cups and devoured them (I couldn't find couverture chocolate, but a bag of Ghirardelli's milk chocolate chips was a good substitute). -Skip the takeout- make your own Thai. Add your peanut butter to this tasty thai peanut sauce recipe and toss over salad or rice noodles, or serve with satay. -Why mess with a classic? Peanut butter and jelly sandwiches.